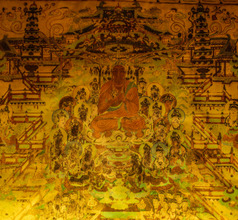 The proximity to a wonderful UNESCO World Heritage Site has made the city of Dunhuang a much-visited tourist destination. 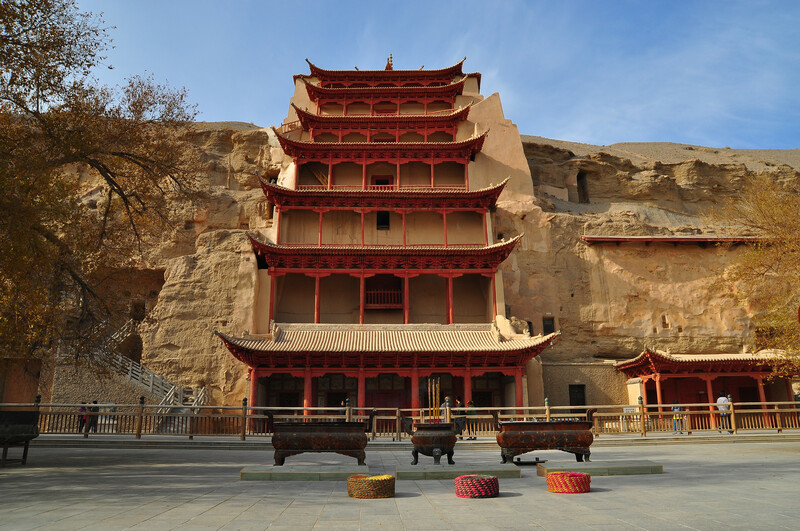 Dunhuang City lies along the Ancient Silk Route and there are many old relics around the city that showcase the rich history of the region. 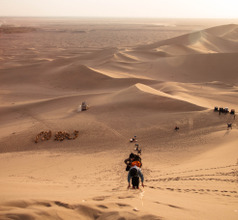 Also, being an oasis in the middle of the Gobi Desert, rather than detract tourists, it has lured domestic and overseas tourists to visit and appreciate its interesting cultural and historical sites. 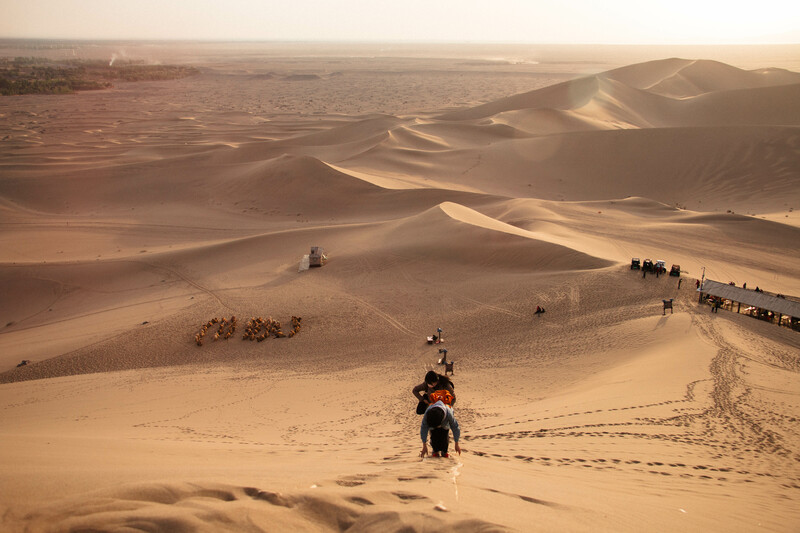 The golden sand dunes are so famous, that Dunhuang is also called the “city of singing sands”. 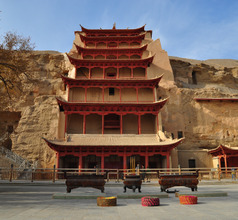 Dunhuang City was a major stopover along the Ancient Silk Route, where traders from nations like Persia, Arabia, and India came with their caravans for conducting business. At the time, the region was occupied by the Xiongnu, which was a kind of federation of nomadic tribes and ethnic groups of Central Asia. 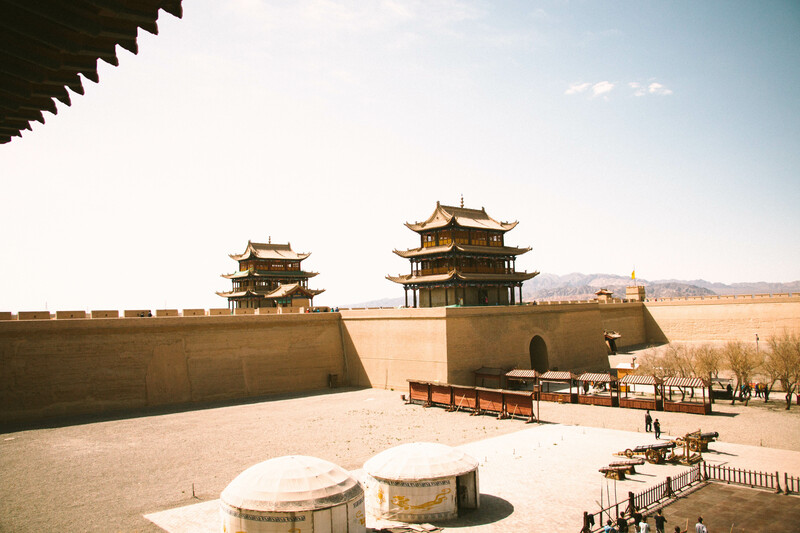 With the established of Chinese rule during the Han and Tang Dynasties, the city of Dunhuang became a bustling commercial and trading town. 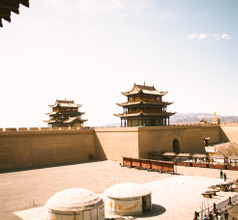 Considering its strategic location in what was termed as the Hexi Corridor or Gansu Corridor, the city also had garrisons protecting the Chinese interests against invaders from the northern regions. Later still, with the arrival of Buddhist monks, several monasteries were set up in the region. 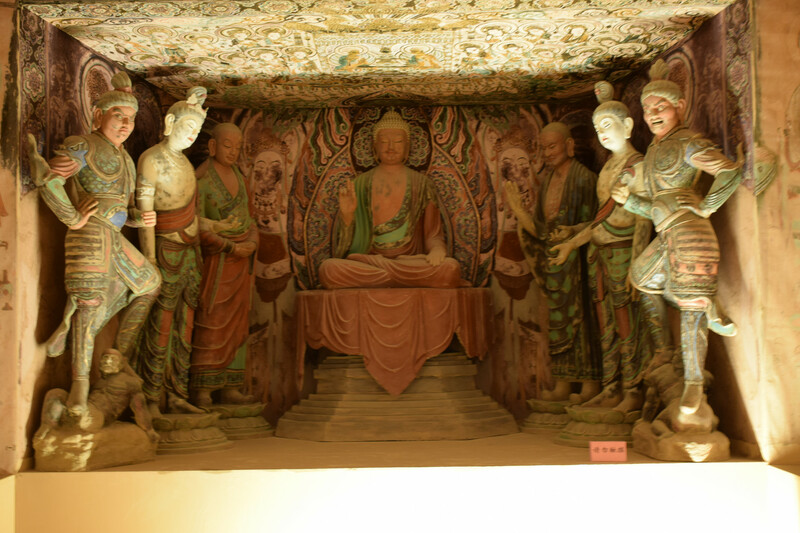 The Dunhuang Theater is an ancient classical art form that is specific to the region and is popular especially with overseas tourists. 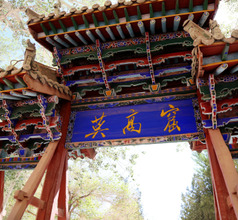 Today’s Dunhuang oasis is a beautiful city with lush greenery, farmlands, as well as interesting desert areas. It has retained its old-world charm instead of turning into an ultra-modern city with towering skyscrapers, traffic jams, and air pollution. The Shazhou Night Market is a very popular spot that Chinese and overseas tourist love to visit. This charming market looks similar to the souks in the Middle East and contains several snack stalls and souvenir shops run by the local Uyghur ethnic minority people. 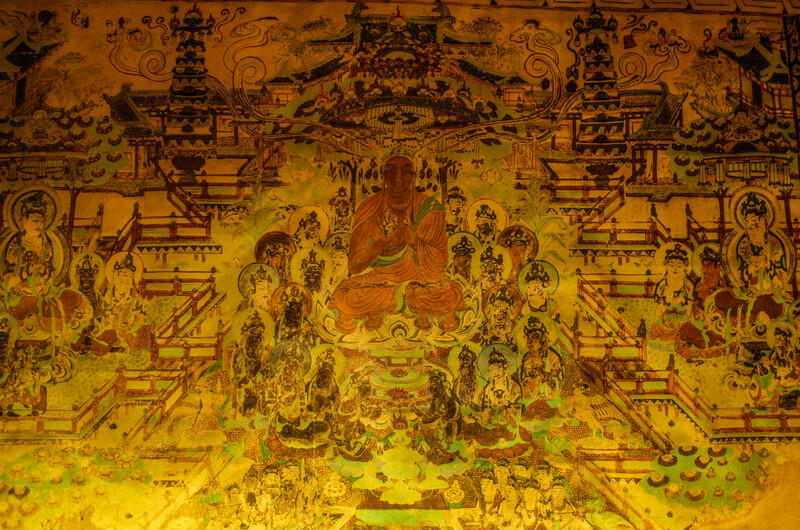 Going by the murals in the Mogao Caves one can estimate the artistry of the local Uyghurs people. They sell exquisitely crafted painted canvases, scarves, jade jewelry, jade showpieces, engraved stone miniatures, medal-shaped souvenirs, and more. 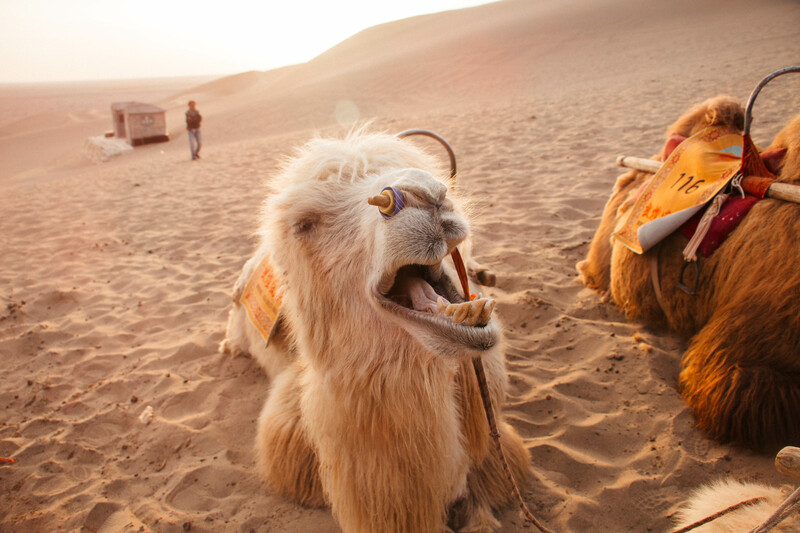 From ancient times to date, the oasis of Dunhuang has developed because of tourism. Today, the city has a wide choice in very comfortable accommodation despite the fact that it lies in the middle of the harsh Gobi Desert. One can choose from 2, 3, 4, and 5-star hotels, country-style luxurious homestays, grade-one hotels, inns, youth hostels, family-apartments, guesthouses, and luxury tents in the desert during the safaris. A majority of the accommodation is air-conditioned and the hotels offer a myriad of amenities to make every visitor’s stay has a memorable one. 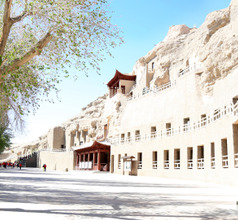 The Mogao Caves, a UNESCO site, are the highlight of the sightseeing tours around Dunhuang City. The site has 735 caves in which there are magnificent murals of unmatched beauty. These murals speared over a wall space of 45,000 square meters and are the largest murals in the world! 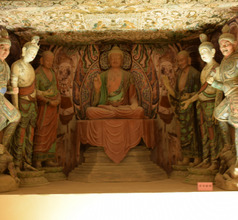 The caves also have more than 2,400 Buddhist sculptures, the oldest of which can be traced back to 1,600 years. This tourist attraction takes more than a day to explore in detail because it contains the largest repository of ancient Buddhist art. 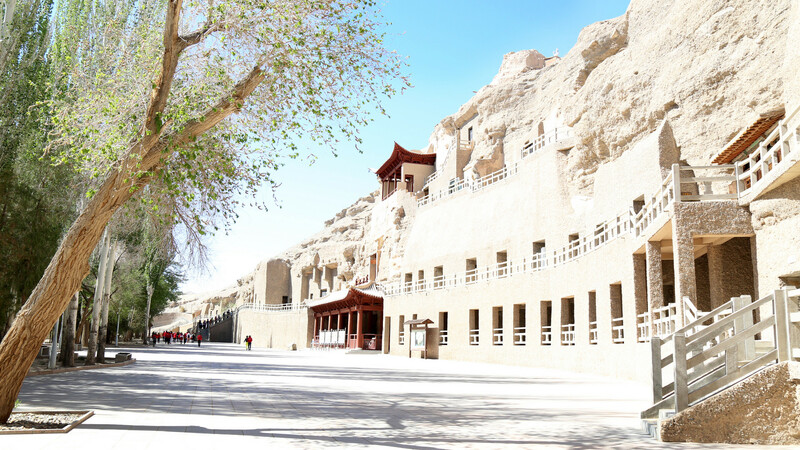 Besides the caves, there is another beautiful tourist attraction within easy reach of Dunhuang City. 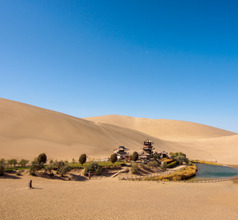 The Mingsha Mountain and Crescent Lake Nature Park is famous for its breathtaking desert scenery and impressive sand dunes. The park area consists of the Crescent Lake that is surrounded by the sand dunes called Mingsha Mountains. This attraction also has a resort where tourists who wish to stay in a desert will find good accommodation. 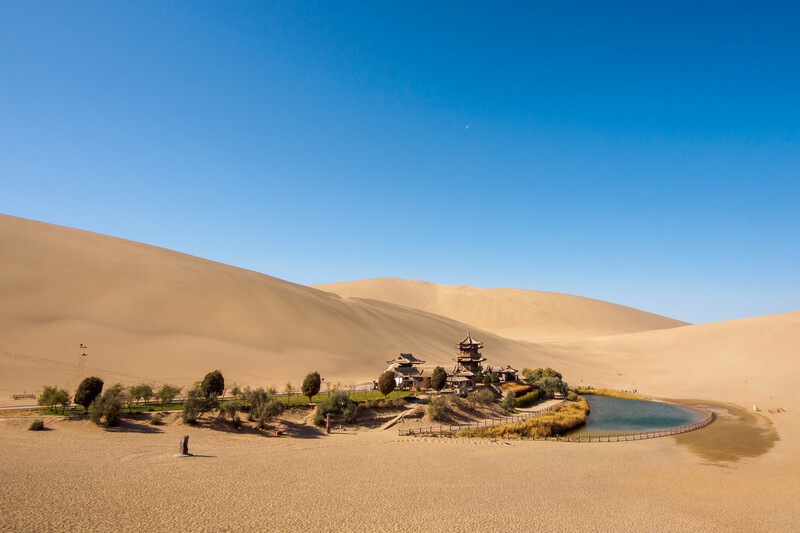 Although it has sand dunes, the park is not too far from the oasis of Dunhuang and consequently, it has a pleasant climate. One of the most unique aspects of Mingsha Mountain is its “singing sands”. When the strong winds blow against the sandy mountain, the sound it makes is surprisingly loud and musical. One can indulge in interesting activities like camelback desert safaris, sand-skiing, and motorbike rides to explore the mountain. But the most popular tourist activity is air gliding which provides a fantastic panoramic view of Mingsha Mountain and the beautiful crescent-shaped lake. The Yadan National Geological Park is another must-see near Dunhuang City. The landscape in the park is so spectacular that scenes from several movies and advertisements have been shot here. The Yardang landforms (unusual natural rock formations caused by wind erosion) look splendid against the desert landscape and are worth photographing. An aesthetically constructed airport, Dunhuang Airport serves the city of Dunhuang in the Gansu province of China. As the new terminal building was recently opened, it is equipped with most modern amenities. Flights go to Lanzhou, Xi’an, Jiayuguan and Huatugou with a seasonal flight to Hong Kong as well. 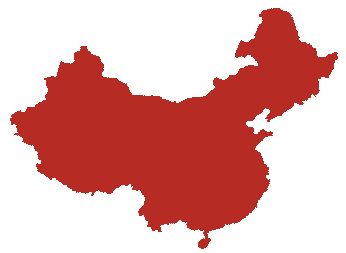 The major carriers that come to Dunhuang are Sichuan and China Eastern Airlines. Center of town is 13 km away and takes 17 minutes to reach. 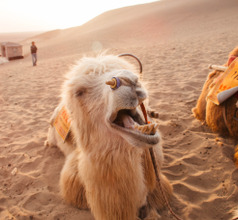 One cannot leave the city of Dunhuang without trying out some of the popular local dishes. The place that has the best eateries is the Shazhou Night Market. 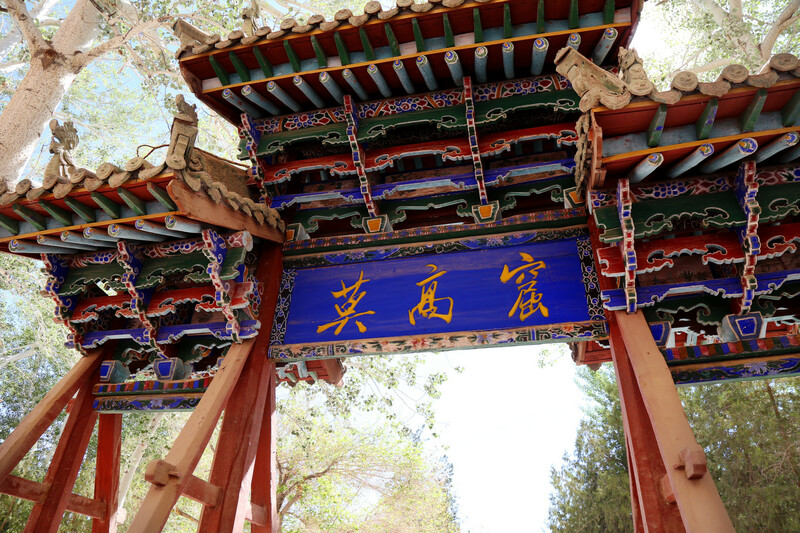 Its outer roads do have a few western-style cafes and BBQ kiosks but there are several stalls that serve the authentic local cuisine of Dunhuang City. They use wheat-flour noodles and don’t use much rice in their dishes. They also use chicken, lamb, beef, and donkey meat in their dishes. Some of the local delicacies are yellow noodles, brewed bean jelly, sheesh kebabs (grilled meat), haggis, lamb pizza, BBQ meat on skewers, etc. The local dates and peaches are also worth a try! Some traditional dishes include Camel Hoof on Silk Road, Stir-fried Hump with Five Shredding, Three Treasures of Anxi, Niang Pi Zi, and Apricot Peel Water.